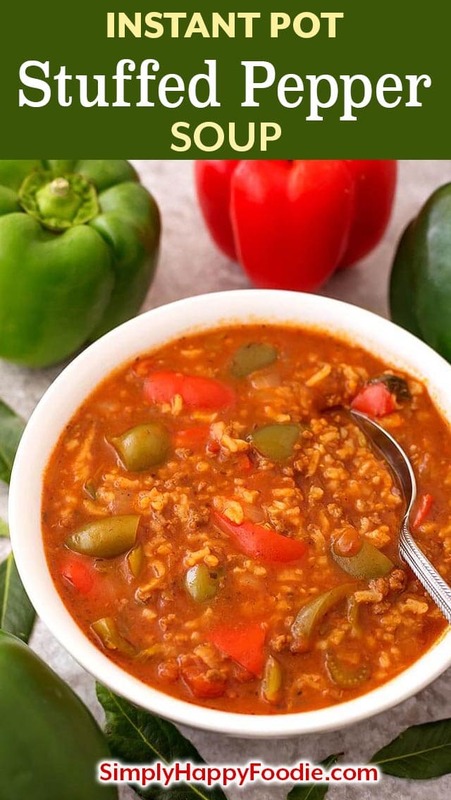 Instant Pot Stuffed Pepper Soup is one of the most comforting of soups. Like eating the best stuffed peppers, but you are eating a delicious, thick and hearty bowl of nostalgia. This Pressure cooker stuffed pepper soup is a wonderful one-pot meal. Raise your hand if your mom, dad, grandma, or someone else close to you made stuffed peppers (my hand is up in the air!)! This nostalgic dish made with ground beef mixed with rice, paprika, onion, and covered in tomato sauce, at its most basic, is a classic American meal. Turn on those reruns of Charlie’s Angels! 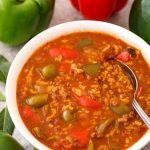 You can make Instant Pot Stuffed Pepper Soup with lean ground beef or turkey. I use around 93% lean, and I don’t have any fat to drain, which is nice. There is just a tiny bit, which is enough to sauté the celery and onion. If you choose ground turkey, just make sure you don’t use ground turkey breast, which will be dry, and you won’t like it. 85% to 93% lean ground turkey works perfectly, and you’ll just need to add a little olive oil to brown the turkey in. 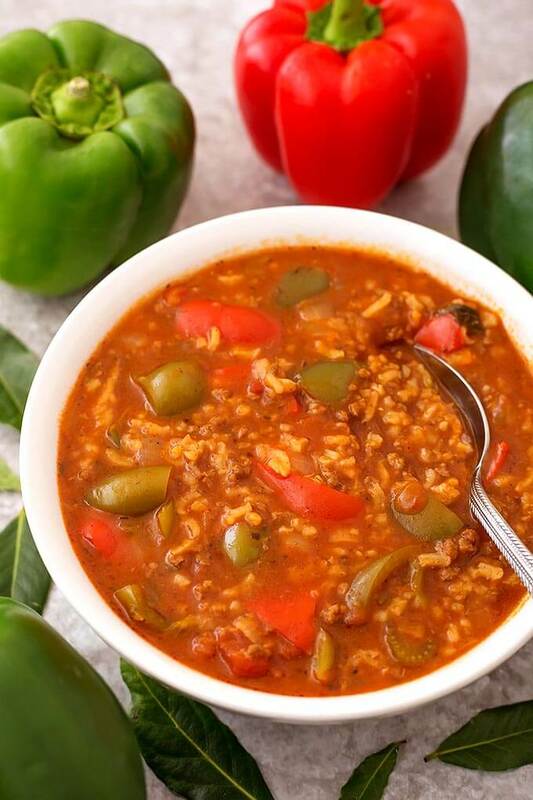 Instant Pot Stuffed Pepper Soup is a comforting and delicious soup that tastes even better than stuffed peppers! 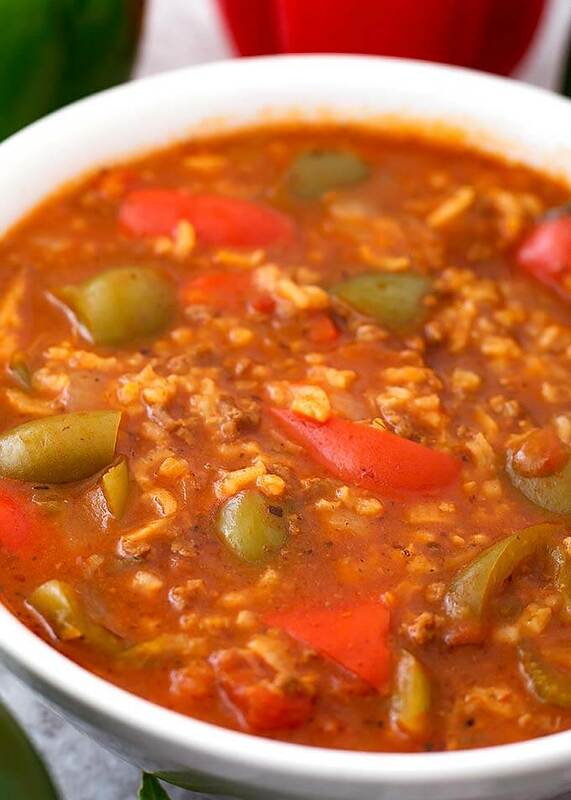 A pressure cooker stuffed pepper soup that you will love! TIP: Before you start to cook this, get all of your ingredients prepped first. Chop and measure everything and this will go so smoothly! Turn on the pot's Sauté function. When the display reads "Hot" add the ground beef and the bay leaf. Cook for 5 minutes, stirring occasionally. Add the celery and onion, and cook for 3 minutes. Add the garlic and spices and cook for 30 seconds. Add the peppers, and stir. Pour in the 4 cups of beef broth, Worcestershire sauce, and the rice. Stir. Put a lid on for a few minutes to let the broth heat up ( I use the glass lid, or the PC's lid on venting). Add in the tomato sauce and diced tomatoes & their juice, but do not stir. Place the lid on the pressure cooker and lock in place. Set the steam release knob to the Sealing position. Cancel the Sauté function and set the Pressure Cook/Manual setting. Use the +/- button (or dial) to choose 4 minutes. High Pressure. It will take several minutes for the pot to come to pressure. After the cooking cycle has ended, let the pot sit undisturbed for 10 minutes (10 minute Natural Release). Then turn the steam release knob to the Venting position and Quick Release the remaining steam/pressure. When the pin in the lid drops down, carefully open the lid and stir the soup. Taste and adjust salt, if necessary. This came out great! There was not much broth (similar to pictured) and we prefer a lot so I added additional beef broth. Thank you for the amazing dinner. Hi Rachael! Thank you for the review. I love a thick soup, but as you did, it’s an easy fix to make it soupier. I’m glad you liked it! This is our new favorite soup. Just perfect as written. And, I never say that. Sandy, this is by far the best soup. MY 20 year grandson found your recipe and asked if I could make. I said sure, I will give it a try. No one in the house was disappointed. It is awesome and delicious. I saved a bowl of it and took it to my BFF, and her words were Oh My God, I want more… Thank you for your knowledge and for sharing it. This recipe will be live in this house for a very long time. Hi Donna! I’m super happy that you and your grandson, and family liked this soup! I love that your grandson found it and asked you to make it! I appreciate you taking the time to review this recipe! Oh Larry, I’m sorry you got the burn message. I don’t know what to tell you except that in our testing, we got it to come to pressure without burning. I had recently decided to revise the instructions to adding the tomatoes & sauce on top, last, and not stirring it after adding them. Tomatoes have a lot of sugar and of course make the soup thicker as well. The newer IPs seem to be way more sensitive to the burn message. Our IPs that are 1-2 years old never burn. Our new one has, but usually on something thicker, like chili. Sorry about your experience, this is a very good recipe. I have updated the instructions in hopes it helps. Have you tried freezing this? I have some peppers I need to use up but have other things for lunch this week. Sounds so good. I would probably half it since I have a 3qt and would be the only one eating the soup. Hi Laurie, I haven’t tried freezing this soup yet. My family eats it up so I never have much left over. I would try it and see. I have frozen, Tomato Rice soup, Mulligatawny, and many others. They have all reheated just fine! I have frozen in 2 cup portions in ziplock bags. Its as delicious as it was when first made.oh I dont add rice. I make instant rice on the side. So not sure how it is if you freeze with rice. Has anyone tried substituting the long grain white rice with short sprouted brown rice, barley or pearled farro? That’s great, Sandy! Thank you for letting me know! Awesome recipe! I turned it vegan by substituting meatless crumbles and vegetable broth. Just delicious. Thank you for the spot on “stuffed pepper” taste! That’s great, Christine! How nice that you could make a small adaptation to make this recipe fit your diet, without losing any of the flavor! Thank you for the review! Someone asked about freezing it and yes, it freezes well! I placed the last serving into a ziplock freeze bag and when i went to thaw it out, i let it naturally thaw for about and hour before i placed it in a saucepan. Delicious! Could you use jasmine rice instead of long grain white? If so do you think I would need to add more or less time.? Hi Rebecca! I think you could. I’m confused, recipe says uncooked rice, and in the instructions it says to add the rice, but your telling Rebecca didn’t doesn’t matter on the rice since it’s already cooked so could please clarify. Tammy, it is uncooked rice. Sorry for the confusion. That comment was made before I updated the recipe. Thank you for bringing it to my attention! So yes, rinsed, uncooked rice. I used Jasmine rice, I didn’t have any other kind. It came out fine. The rice gets kindof mushy though. I was fine with that and it didn’t affect the taste negatively at all. Its not firm like white rice though. Made this last week, added extra burger, peppers, and broth. I had no Thyme so I omitted. There were no leftovers. Yum! I’m so glad you liked it, Shayla! Thank you for your review! Omg!!!! This is amazing. I will make this once a week at least. Perfect. You won’t be able to print a recipe directly from Pinterest. You can click on the link to the web page where the recipe card is. Then click on the print button that is on the recipe card. Or use the Print Recipe button at the top of the post, above the first main photo of the recipe. Amazing!!!!! Came out perfect on the first try. It’s easy to increase the amount of liquid, peppers or rice for future use. I love that I didn’t need to cook the rice before adding it. Are you able to make this recipe so it can be shared on Pinterest? Hi Billie, I’m so happy you liked this soup! Yes, here is the pin for this recipe: https://www.pinterest.com/pin/650559108649171530/ Thank you for your review! Any suggestions for how to make this a freezer version? I’d like to prep it, freeze it, then cook in the Instant Pot. I would try freezing it as is, in quart size freezer bags. 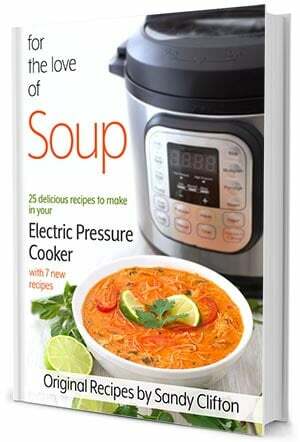 You will want to heat the soup on the Steam setting, using the Pot-in-Pot method. It would be good to freeze the bags in a shape/size that will fit your PIP pan. If you have a 6 qt pot, that would be a 7″ or maybe a 6″ pan. Made this today & although I forgot the paprika & had no thyme and I only had Minute rice so I cooked it separate……this was delicious! The bf ate 3 bowls! Thanks! That’s great, Kim! I’m happy to know you and your bf liked this! Thanks for your review! That’s great, Nancy! Thank you so much for your review! I made this today and it turned out amazing!! Except the rice was a little mushy for me.. Would cutting down the natural release time stop that from happening? Hi Nicole, yes, cut some time from the natural release or from the cook time and your rice will be firmer. Thank you for your review! I cook at a dive bar on Saturday’s and I’m always hoping I sell out. I have to say that I had no problem with your soup… it was gone! Wow Nick! I LOVE dive bar food! I have to say that I feel honored that you chose to make my recipe at the bar! SO AWESOME! Thank you for your review, you made my day! This recipe is amazeballs! I 1 1/2’ed it. You definitely can’t double it in a 6 qt. My family loved it, and now it will be added to our dinner rotation. There should be a caution or warning for those of us who are very sensitive to spicy heat in a recipe. I followed this recipe to a tee, and against my better judgment, added the 1 tablespoon of paprika as written. Sadly, I cannot eat this soup. My husband can and did enjoy it but today I am looking for remedies to tone down the heat. Too much spice actually hurts my stomach. Sorry. My goodness, how awful! May I ask what type of paprika you used? Paprika has no heat unless you buy what is labeled as hot paprika, to my knowledge. This recipe should not be spicy at all. I made this tonight; I was by far one of my favorite IP dishes. Thank you so much for sharing! I’m still new to Instantpot, but your meticulous directions made it easy to follow the recipe. We enjoyed it so much even with all green peppers. Looking forward to having a red pepper to include next time! Thank you for perfecting the recipe! HI Linda, I’m so glad you liked it! Thank you for your review! Its in the pot now! Hoping someone will answer this. There are two settings, high or low pressure, which should I use for this recipe.